June 5, 2018, 11:49 a.m.
— It would seem to make intuitive sense that, if things are going badly for the political party that you identify with, then you’ll be more likely to tune out the news. (Unless you fear-read — but maybe that’s more of a news junkie behavior?) Also, Trump’s approval ratings have been ticking up since February when Pew ran this survey; how does that interact with the finding that Republicans are also more tired of the news? — What’s going on with white people? Why are they so much more tired of the news than people of color? There seems to be so much psychology involved here. 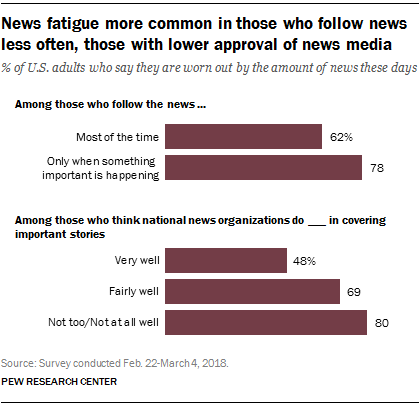 Do people avoid news when they feel guilty, for instance? If everything is presented as terrible, do people just tune out? Are white people more likely to tune out? There is a lot to unpack here and I want to know more, more, more. Owen, Laura Hazard. "Who’s exhausted by news? Everyone, but especially Republicans, white people, and people who don’t follow news closely." Nieman Journalism Lab. 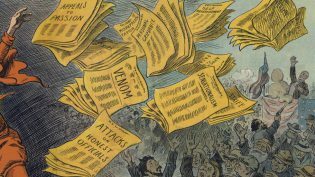 Nieman Foundation for Journalism at Harvard, 5 Jun. 2018. Web. 25 Apr. 2019. Owen, Laura Hazard. "Who’s exhausted by news? Everyone, but especially Republicans, white people, and people who don’t follow news closely." Nieman Journalism Lab. Last modified June 5, 2018. Accessed April 25, 2019. https://www.niemanlab.org/2018/06/whos-exhausted-by-news-everyone-but-especially-republicans-white-people-and-people-who-dont-follow-news-closely/.